With prices of petrol still rising, we wish we have vehicles that run on electricity these days. We have yet to see an electric car to be available here and even if Tesla opens shop it would cost like a luxury car. 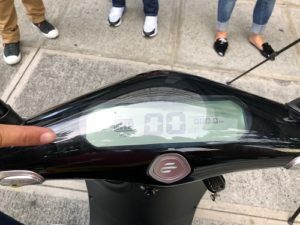 While we wait for affordable electric cars to be available commercially, here’s one alternative to consider: an electric scooter. Ecooter has just launched their electric scooter line for the Philippine market and it will be available through local dealers very soon. While there are cheap electric bicycles being sold already, their quality still leaves a big question mark. Build quality doesn’t seem to be stable and if you lose battery charge (which is short) while traveling, the rider has to pedal ’till he gets to his destination (if you think that’s easy, the pedal in an electric bicycle is heavier than a usual bike.) The Ecooter looks trendy on the road and riding one doesn’t feel I’m riding in a cheaply made scooter. It has a 2,500W electric motor that is capable of reaching a top speed of 75 km/h and a distance of 80 km when the battery is fully charged. The display panel shows a digital speedometer and odometer as well as a battery meter. There’s a SMART button found on the right handle that can limit your speed up to 40 km/h. The SPORT option is to make it run faster. 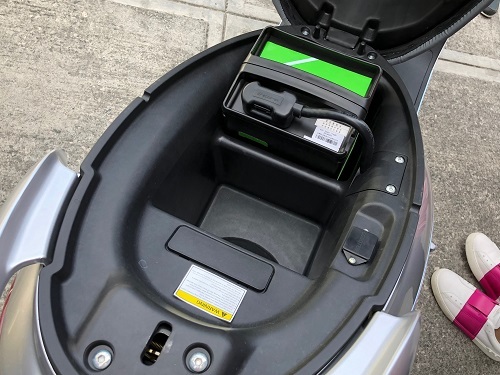 The battery of the ECooter is a Lithium-Ion battery that can be fully charged in 6 hours. 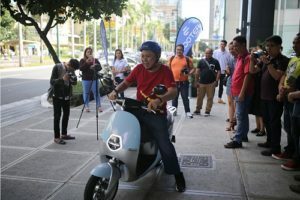 Already sensing that those riding the ECooter will encounter battery issues in the future, Sobeler Corporation’s Managing Director Ms. Virgie Lim said they are already talking to dealers and 24/7 convenience stores 7-Eleven and Family Mart for a possibility to have a battery-swapping program. According to Lim, what they would like to happen is if ever an ECooter rider rans out of battery and doesn’t have time to charge, he can swap his battery with an accredited dealer/convenience store for a fully charged one for a minimal fee. The battery swapping program once implemented will be initially available in Metro Manila. 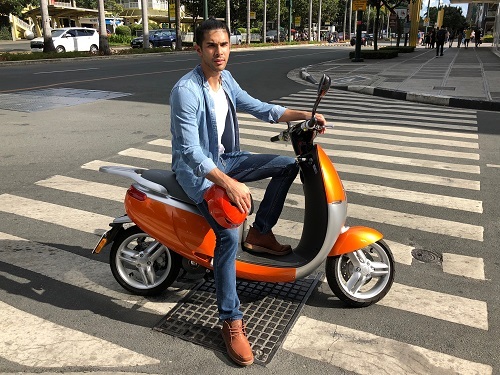 Honestly, I have a fear of riding motorbikes or scooters, but I managed to get my bearings and try out an ECooter… even without any experience of driving one. After almost getting hit by a car, I was able to make it run. It was fast, but without the noisy engine I usually hear on the road. Riding one is actually fun, I just need more practice so I can get used to it. 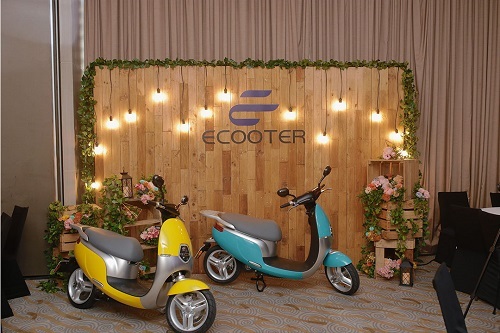 The ECooter’s price is P80,000. According to Lim, the dealers will provide the battery upon purchase as well as inclusion in their battery-swap program. While I do not recommend not participating in the swap program, customers can just buy a charging kit that includes a battery and a charger for P30,000. I asked Ms. Lim if the dealers are offering flexible terms similar to ordinary motorcycles and scooters. Unfortunately she doesn’t have an answer for now but suggests the dealers may offer it on their own. Available colors are Black, Gray, White, Red and Yellow. The ECooter is distributed locally by Sobeler Corporation.